Summary: The title Pontifex Maximus began as a name for ancient pagan rulers, but has since been adopted by the Papacy. The papal title Pontifex Maximus can be traced back in different forms to the ancient Chaldean times. When Medo-Persia conquered Babylon, the Babylonian religion was maintained, but after a revolt of the priesthood, the priests of Babylon were driven out of Medo-Persia, and established themselves at Pergamum, taking with them their titles and vestures. 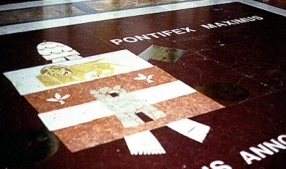 The present-day college of cardinals with the Pope at the head is identical to the college of pontiffs with the Pontifex Maximus at the head. The keys that the Pope wears around his neck are not the keys of Peter. Rather, they date back from Babylonian times, when it was supposed that this representative of God had the power to unlock heaven or hell. i. William Barry, The Papal Monarchy: From St. Gregory the Great to Boniface VIII (New York: G. P. Putnam's Sons, 1911): 45-46.